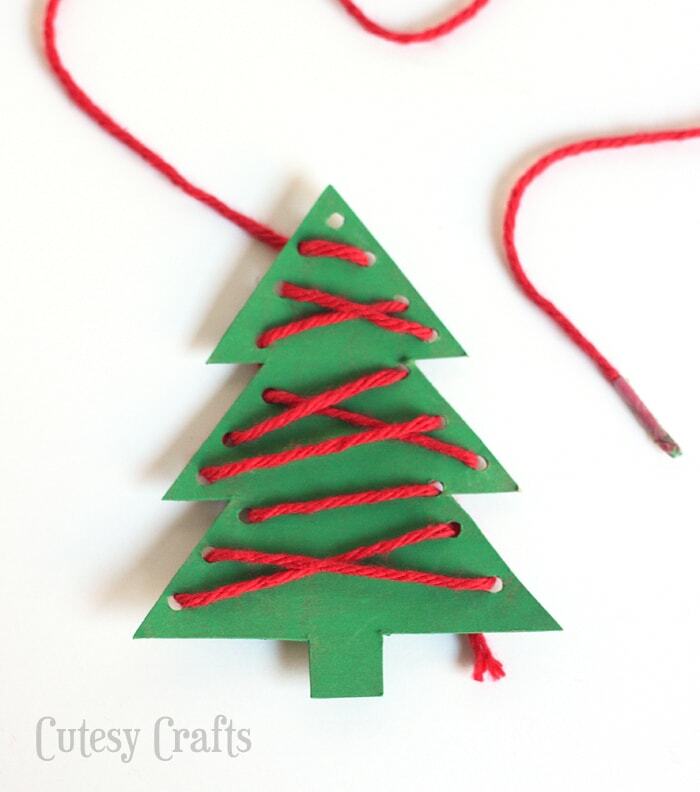 When I was a kid, I always loved putting the ornaments that I made on the Christmas tree. Maybe that’s why I love making ornaments so much now. Every year, I like to come up with something for my kids to make so they can feel that same joy. 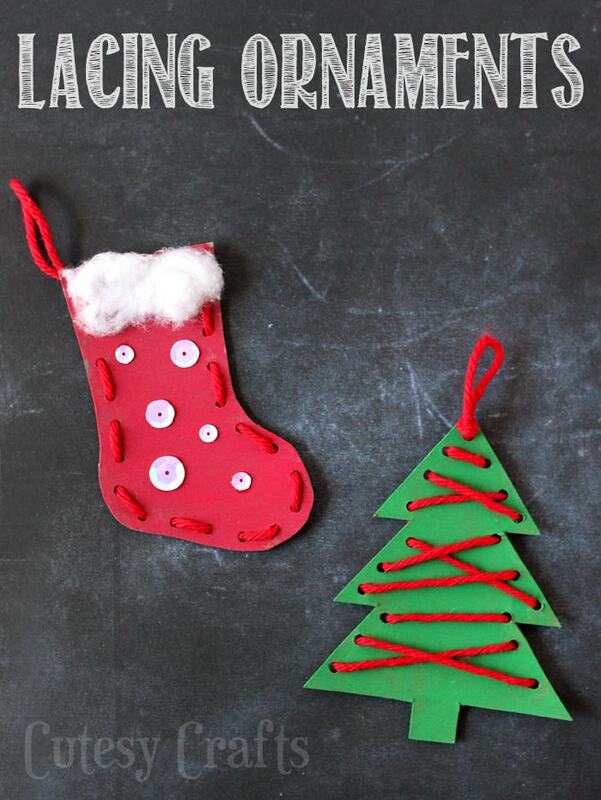 If you are looking for a Christmas craft for kids to make, these lacing ornaments would be a great one. 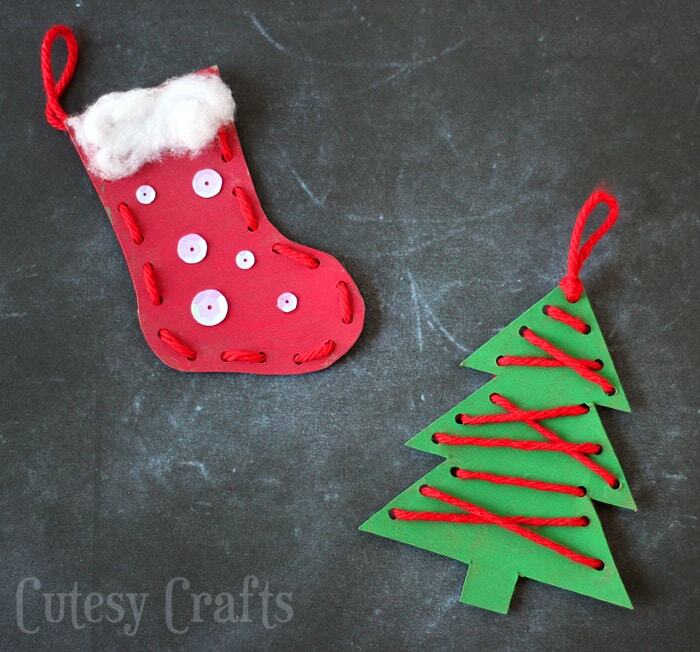 They are cheap, easy to make, and can be made without paint if you don’t want a mess. 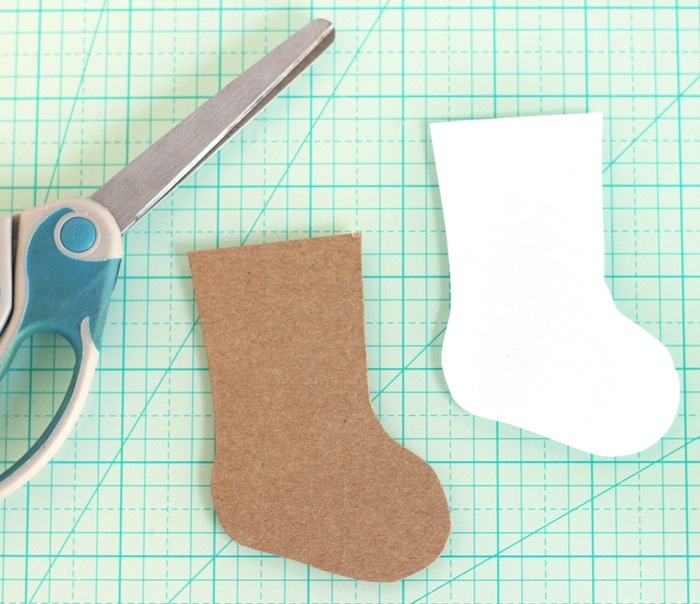 Use the templates to cut out stockings and trees on some chipboard. It’s a very thin cardboard, like cereal boxes. In fact, you can just use a cereal box, but then you have to get some paint (or construction paper) that will cover the words and such. 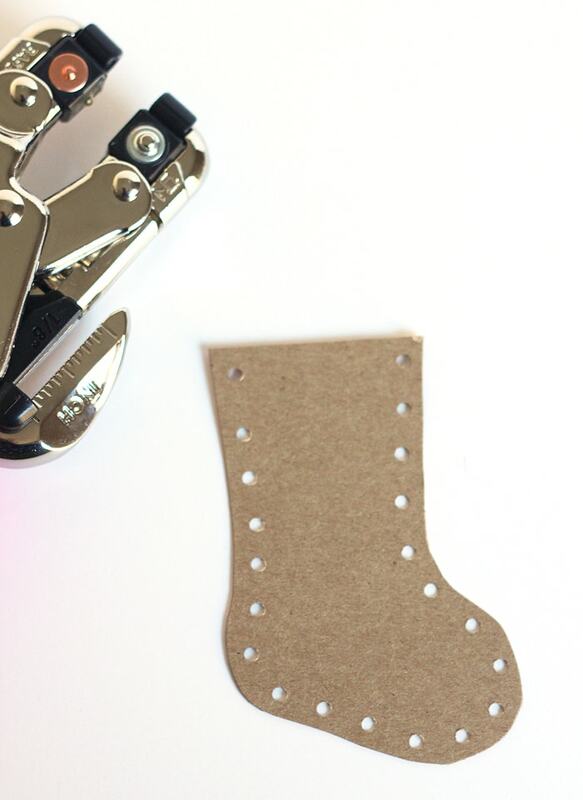 Use a 1/8″ hole punch to punch evenly-spaced holes around the outside of the stocking. No need to punch the top. Let the kids paint the front and let it dry. When painted, the chipboard will curl up a bit from the moisture. Just flatten it after it dries a little, and it should be fine. We used children’s washable paint for this, which would not cover words on a cereal box. 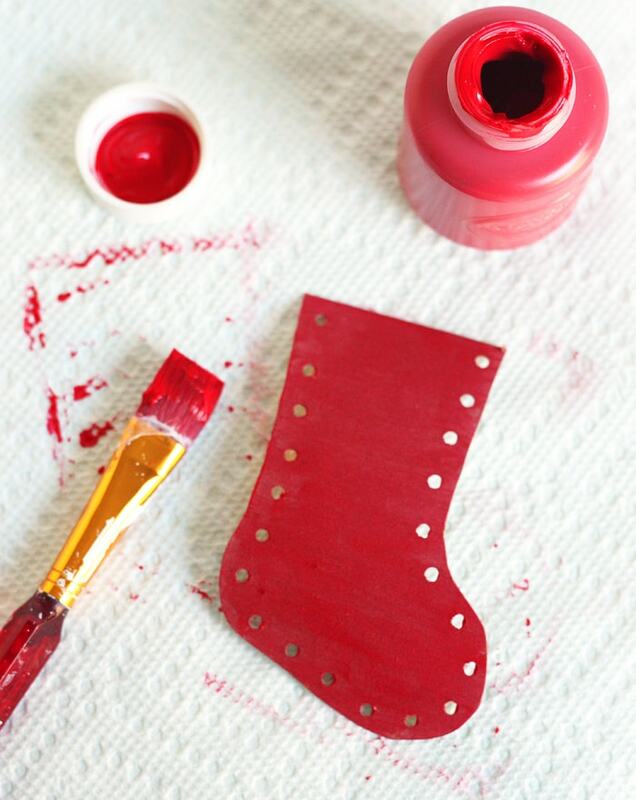 You can either use a more opaque paint, or glue a piece of construction paper on the back before punching the holes. 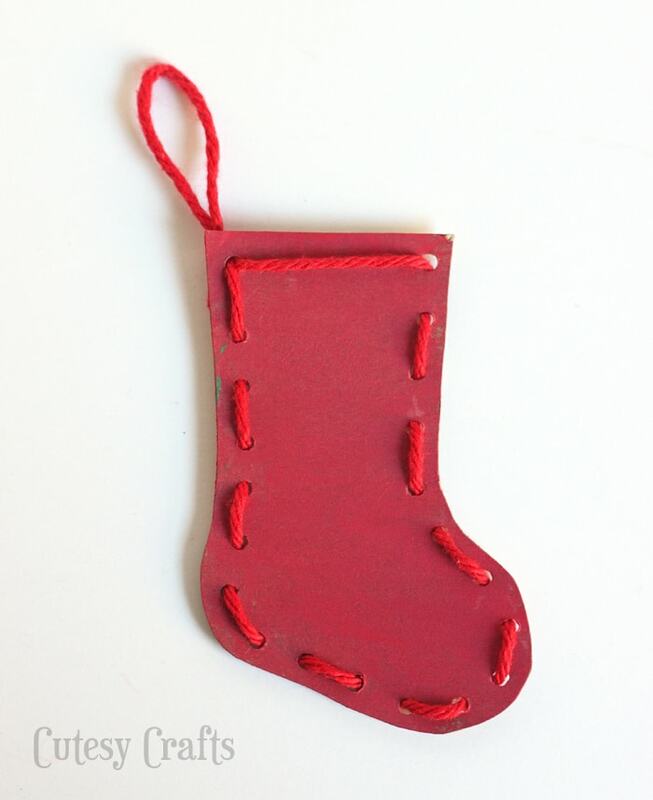 If you are anti-paint you could even just use the construction paper as the front of the ornament. 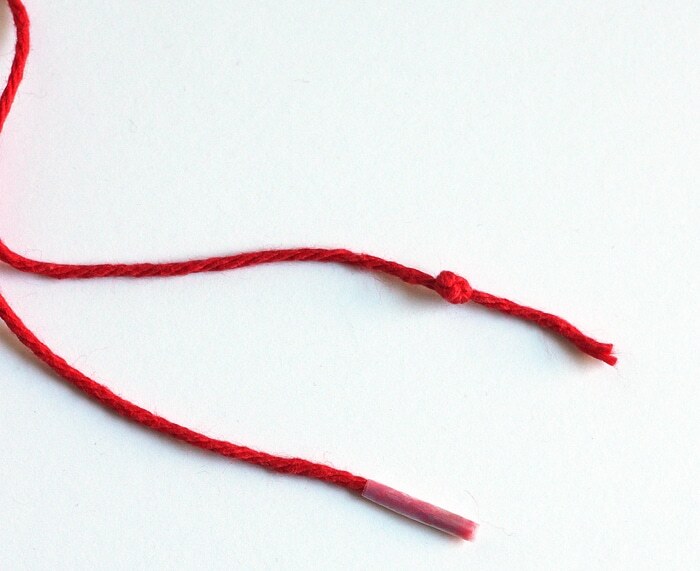 Cut a piece of yarn and tie a knot in one side. Wrap a small piece of tape around the other side to make it easier to thread through the holes. Best to use a thin yarn. Anything fluffy would make things difficult. 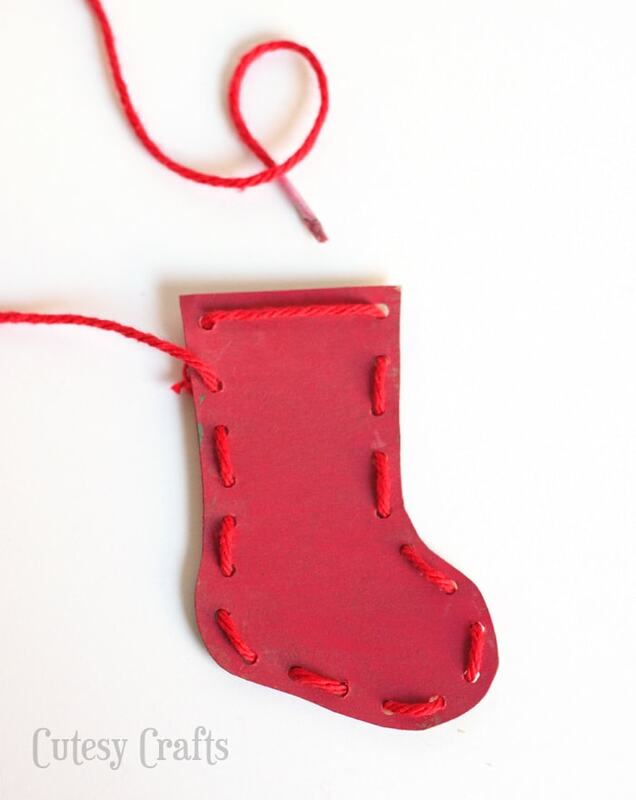 Bring the yarn through from the back and let the kids stitch through the holes, just like they would a lacing card. When you get back to the starting point, make a loop and tie a knot in the back. 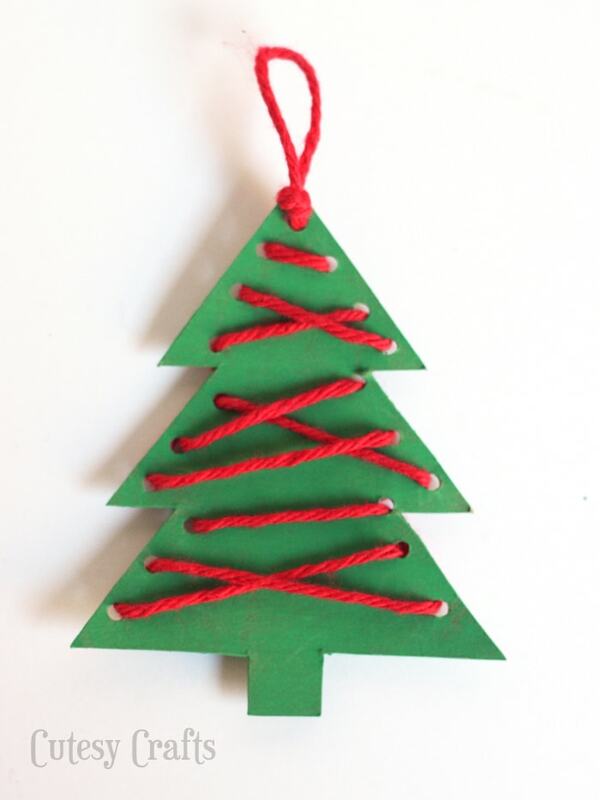 It doesn’t really matter which side the knot ends up on, but you can look at the placement of the holes on my ornament if you want it to be the same. Let the kids go a little more crazy with the tree. I wanted it to look like garland going across it. Start at the bottom and work your way up this time. Make a loop, and tie it in a knot when you get to the top hole. The stocking got a little more embellishments. 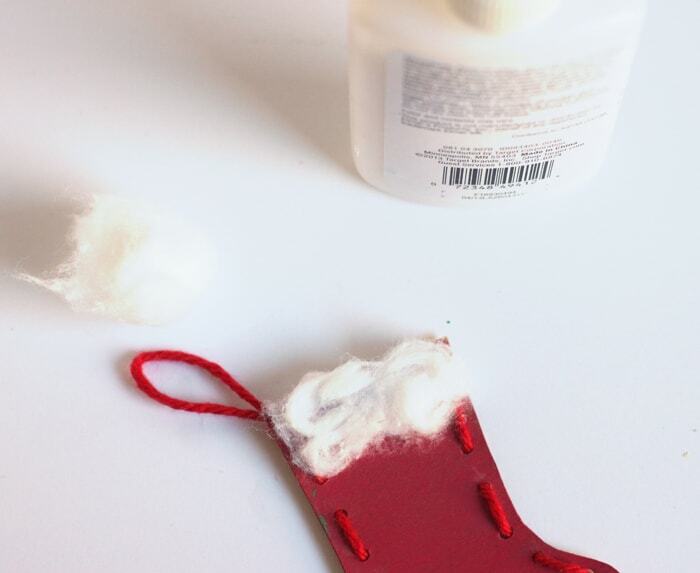 Stretch out piece of a cotton ball and glue it on with a little white school glue. Dab some more glue on the front, and decorate with some sequins. You could also use some small beads or glitter; whatever you want. And that’s it! Pretty easy, but complex enough to keep the kids entertained for a while. And, I just had a BRILLIANT idea after the fact. 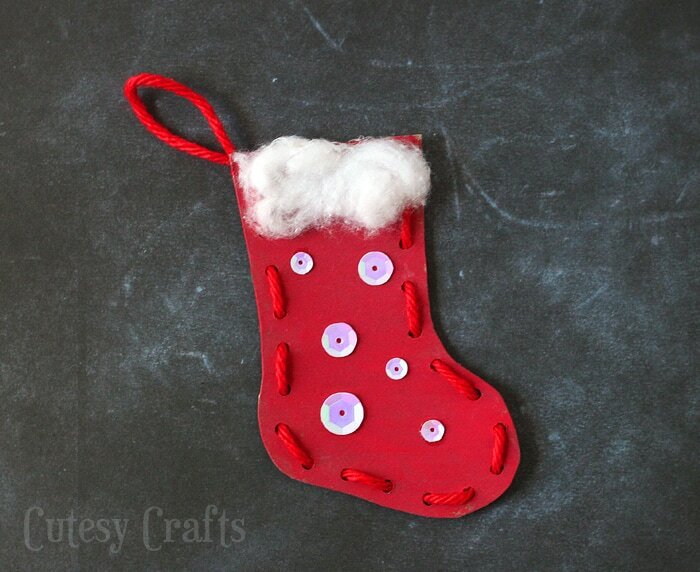 Why not make them out of stiffened felt?! Oh my gosh, that would be SO cute! So many different options with this. Maybe next year. 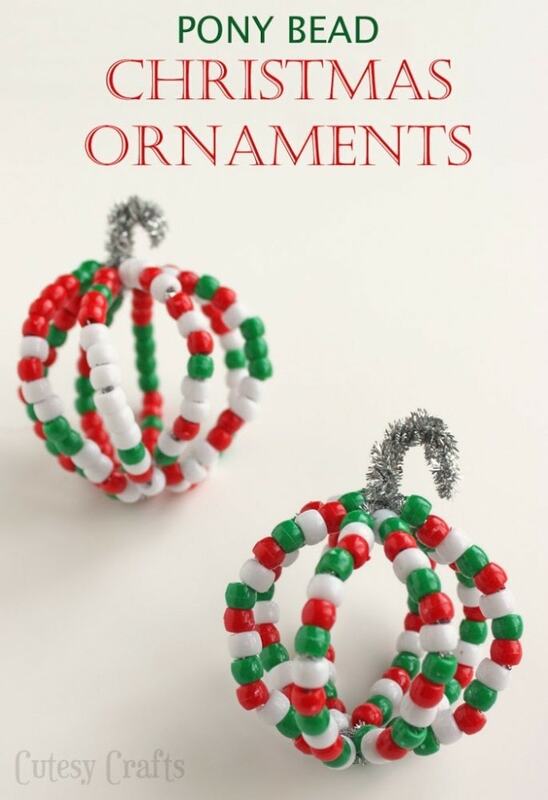 You might also like these pony bead Christmas ornaments.